If you’re building a 16s BMS, then in your parts you get one long case to house the PCB, but for the 24s version I was doing, I had two smaller cases that I had to put end-on-end. The end-plate that comes with the PCB is meant to replace the blank end-plate that comes with the case. Mine had to be sanded down a bit at the corners to make it fit in the plastic coupler that secures it to the case. This done, it was time slide it together to see if it was a good fit, and that it allowed the PCB to slide in such that the resistors made thermal contact with the case. This was a bit tricky, as it was somewhat stiff and needed some gentle force to make it go in. In the end I took some sandpaper to the surface of the resistors smooth down some uneven parts, however I realised that this caused a few bits of bare metal on the resistors to show and I quickly stopped this. If any of the bare metal were to make contact with the case, then it could potentially cause a catastrophic short. When I finally had it slid together, I took resistance measurements between the exposed metal of the case-end and the resistors, and no shorts seemed to be in evidence. 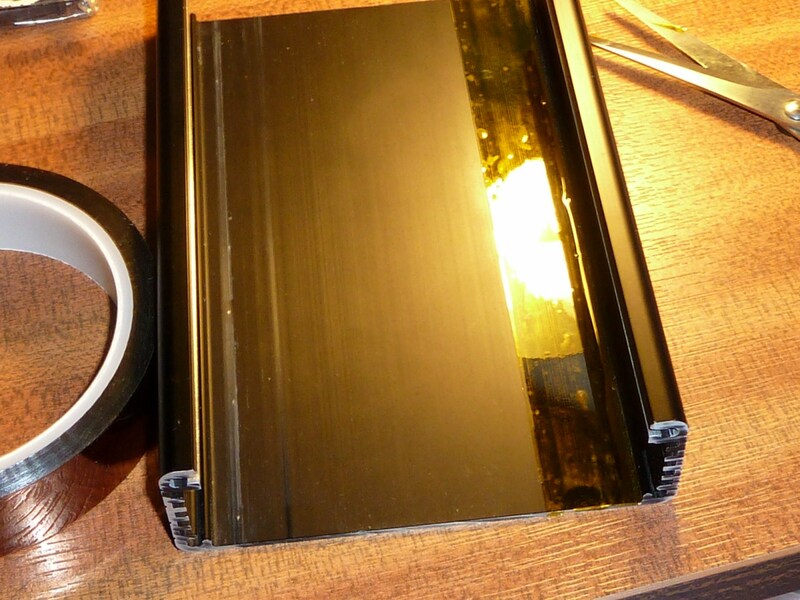 The case itself is insulated by the black paint it’s covered in, but just as a precaution I got hold of some Kapton thermal insulating tape and ran a layer along where the resistors would be touching the case. The instructions don’t offer specific guidance on what grade of wiring to use for the battery main power coupling, charger power input or cell-tap wires, but the holes in the board give you a rough idea of what the designers have in mind. 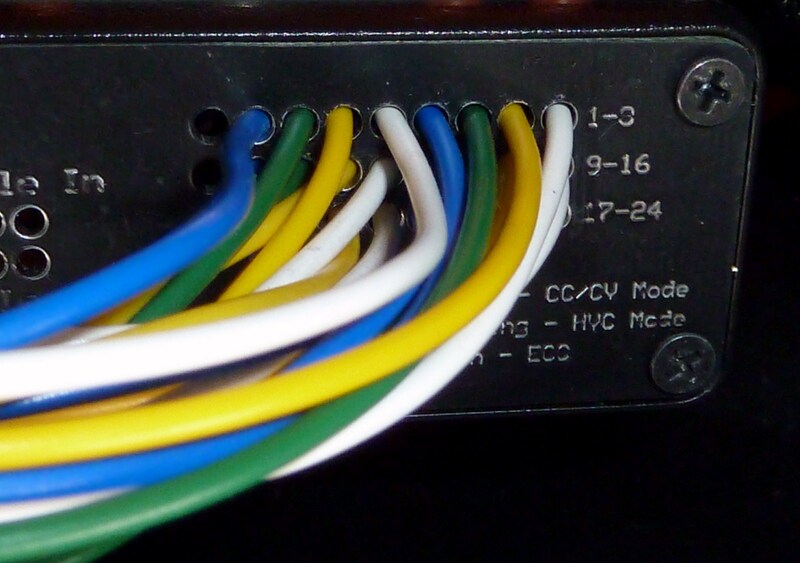 The size of the wires you need depends on what kinds of power supply current you intend to use with the board. The designers of the Zephyr say that you can safely use it with up 20 amps (though you will need the Q3 FET in addition to Q2 installed on the PCB), but the guage wiring depends on how much power you are actually going to support. Obviously the best policy is to ‘future-proof’ it if you want to leave open the option of upgrading to a more powerful charger, and that’s what I did. Although I’m only using an EMC-900 charger, which is capable of supplying 9 amps, I still wanted to be able to support the maximum rated current. 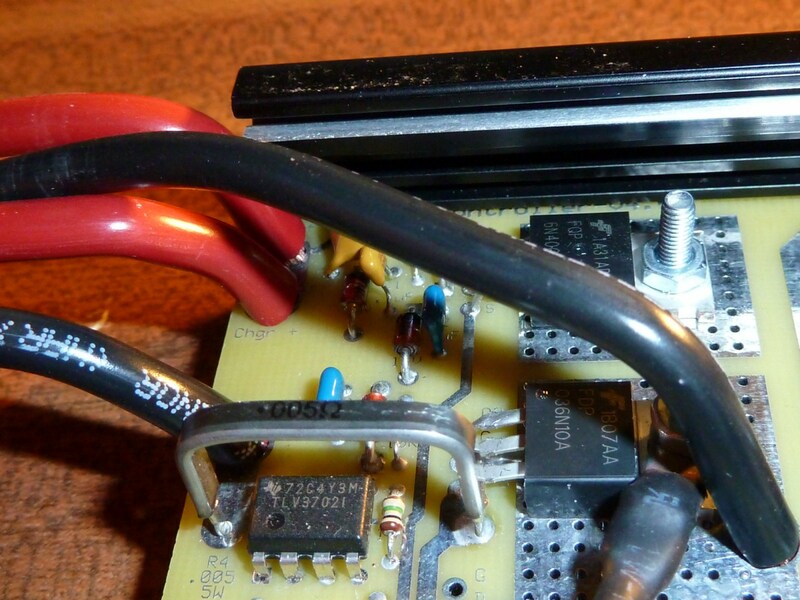 Having the thickest wires possible also makes the whole thing more economical and efficient. There’s less energy lost on the way to the pack through wires heating up, and it all runs cooler. Eventually I settled on the 6mm² wires (around 10 AWG) that the holes on the board were designed to accommodate. Apparently 12 AWG is enough to carry 20 amps, so these would more than enough. I used this grade of wire for both the power supply wires, and for the wires serving the main terminals of the battery bank. The holes in the end-plate were not big enough to accommodate them, so I had to drill them out a little. Here you can see the wires threaded through their designated outlet holes. For the cell-tap wires, I once again opted for the largest wires that would fit into the cell-tap holes, using 1mm² wire (about 17 AWG). This however caused difficulty for my choice of connector. 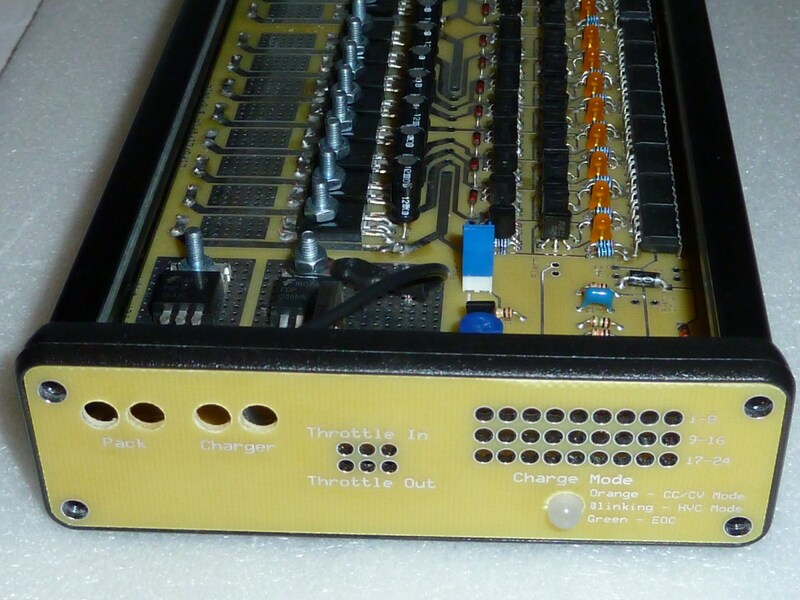 The parts list includes three 8-pin connectors intended for soldering directly onto the tap holes on the board. 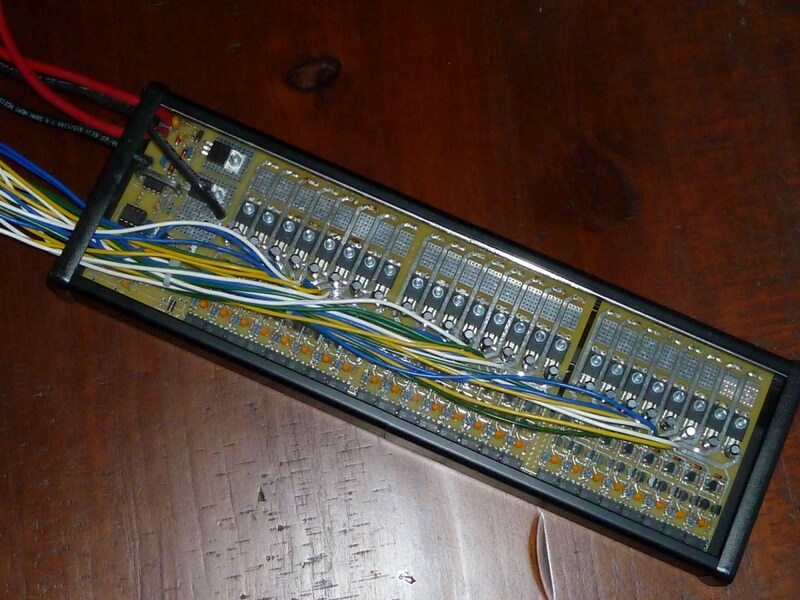 These would then be connected – via another connector head – to groups of eight cell-tap wires running from circuit board, out of the case and directly to the battery bank. I assumed that the idea of this was so that you would be able to unplug the cell-tap wires, separating the BMS from the battery bank. 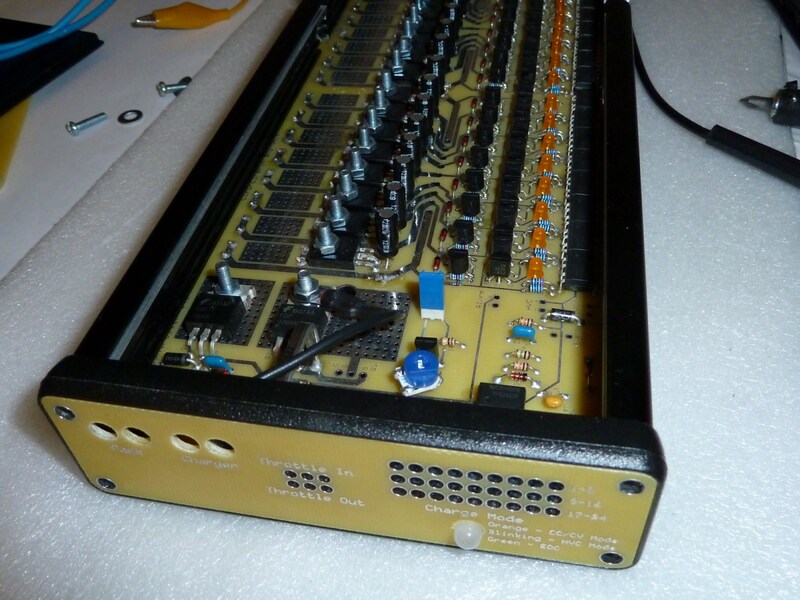 However you wouldn’t be able to detach the cables completely from the BMS unit doing it this way: The tap-wires would be detachable from the circuit board, but not from the case itself because the connectors would still be on the inside of the end-plate. 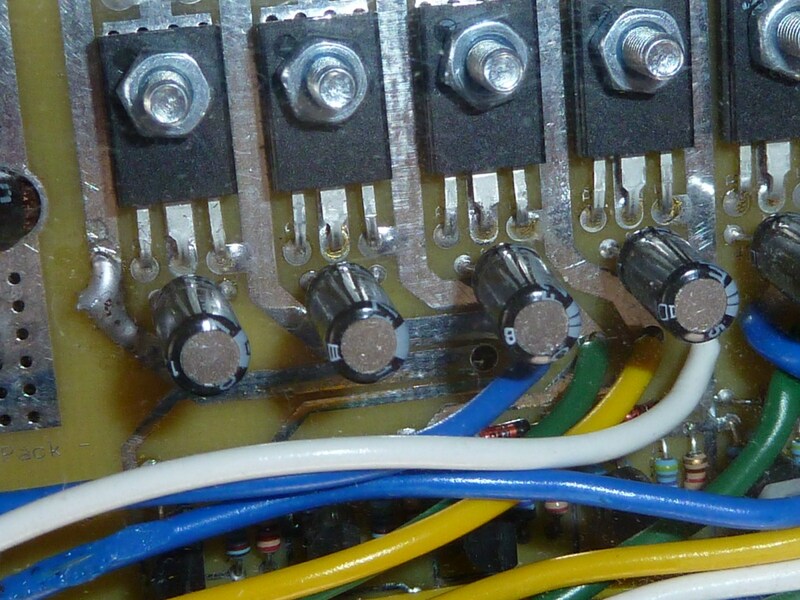 This approach also involved complications of the board-mounted connectors clashing with the positions of some of the shunts and other components, necessitating moving some of them to the underside of the board. Though this clearly must have served a useful purpose for some people, for me I couldn’t see any benefit of doing it this way. Instead, I opted to solder the wires directly onto board, and have them run to a connector external to the case. I was originally planning to use a 25-pin serial port connector for this purpose. Though these are usually used with computer peripherals, they’re perfect for the tap-wires many people are using in their BMS arrangments. These connectors, though, aren’t big enough to house the thicker, 1mm² wire I’d chosen, so I had to find something a bit chunkier. 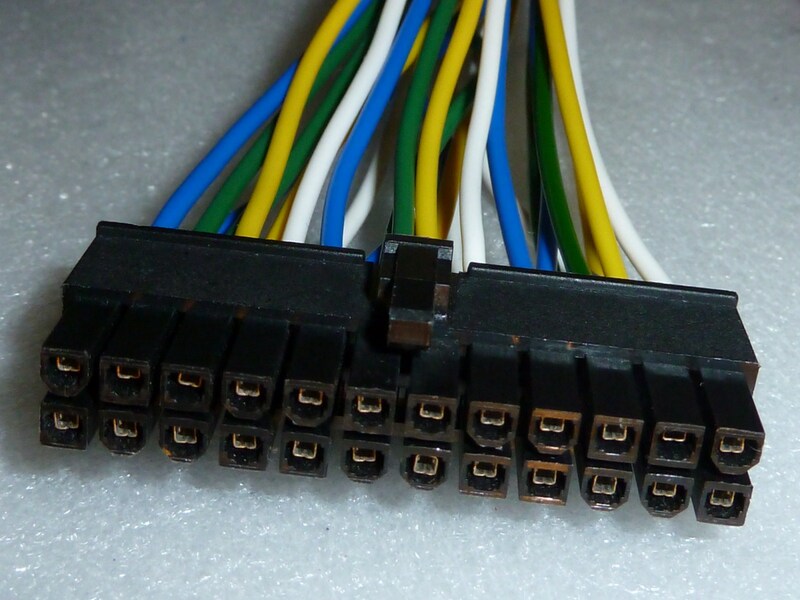 After much hunting around I settled on another PC-based connector – a 24-pin ATX “Molex” connector. These were ideal: affordable and similar in design to motorcycle mini connectors, except with the many pins I’d need for my 24s Lithium pack. I started my wiring for the cell-tap connections from the connector, then worked back to the circuit board, threading the wires through their respective holes in the end-plate. 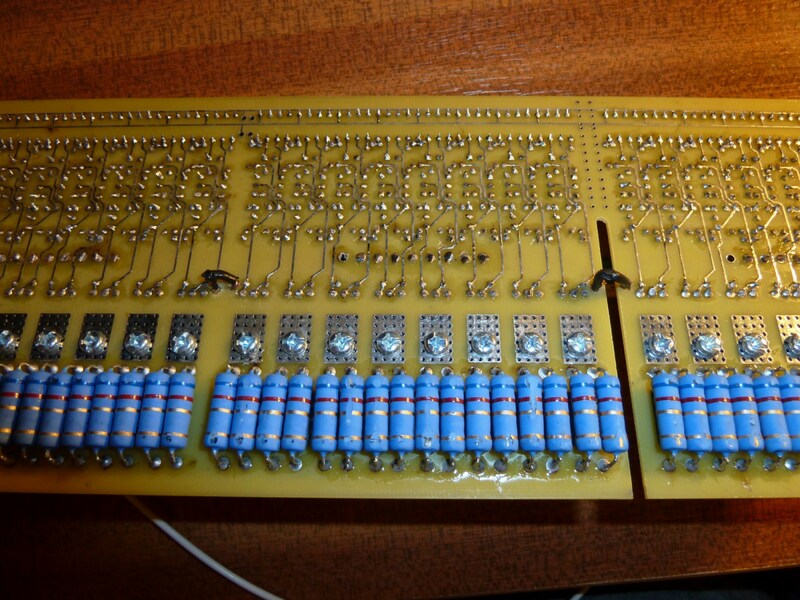 The end-plate has three rows of nine holes, one row for each 8 cell-circuit bank on the board. 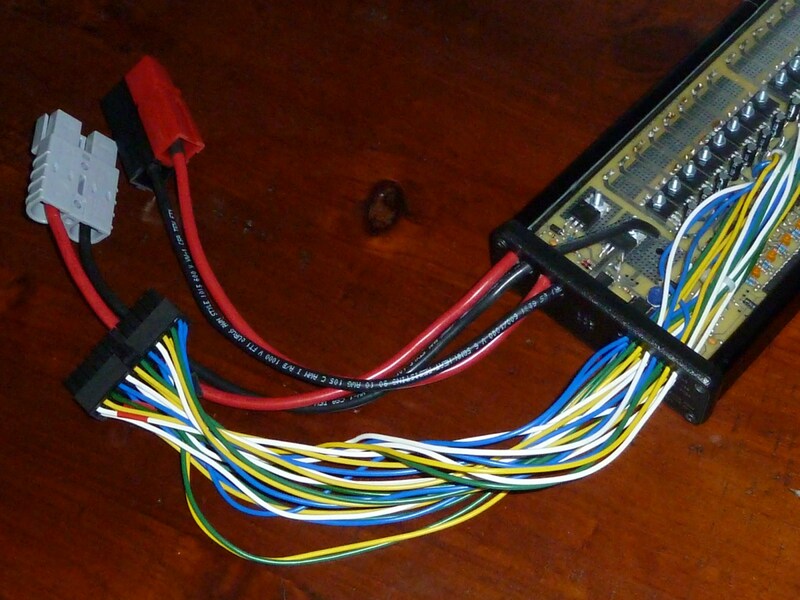 For reasons I’ll explain, I arrange things so that I only need to use only 8 wires per bank so that it ties in nicely with my 24-pin connector. I didn’t like the colour of the end-plate, so I sprayed it black to match the case. You can see the final form of the unit starting to emerge, now. I decided I wanted about 12 inches free-play for the cell-tap wires outside the case, like I had allowed for the charger cables and master battery bank wires. Once I had the wires all laid out close to their final arrangement, I measured and cut off extraneous lengths of the wires to minimise kinks and bunching of wires inside the unit. 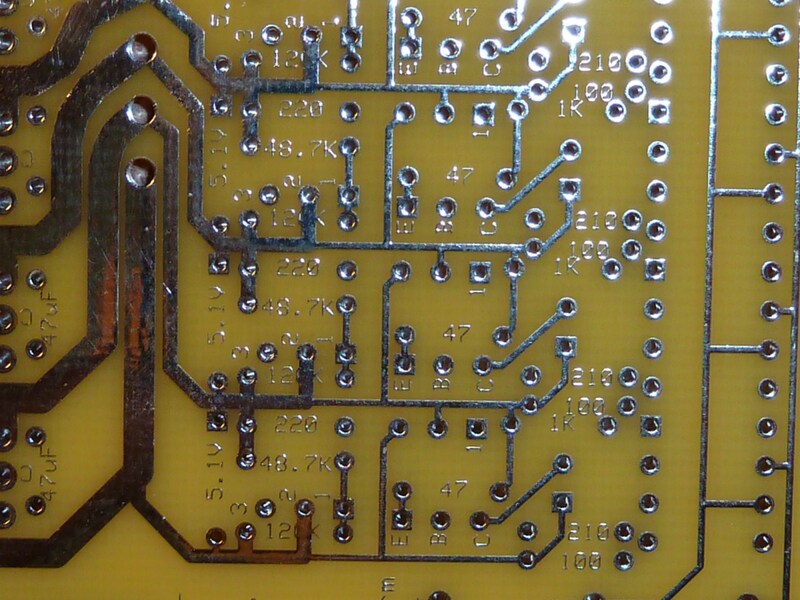 Then they were soldered carefully to the cell-tap points along the length of the board. Once all the wiring was complete, I used cable ties to tidy it up and keep it out of the way of the orange LEDs, which I wanted to be visible so I could see what all the cell-circuits were doing. One consequence of having lots of cells in series is that the wires in between the cells act as both the positives for one cell and the negative of the next cell along. The diagram from the Zephyr assembly manual shows how a Lithium Bank (in this case a 16s bank) is wired up to the cell circuits on the board. For reasons of architectural practicality, the cell-circuit sections of the board are split up into 8-cell sections, within which cell-circuit poles are shared with the cell-taps to either side (cell tap 2 is the positive of cell 1, and the negative of cell 2, and so on…). This means that each bank serving 8 cells of the pack, actually ends up with nine wires, one last one to seal of the unbounded cell in a series. The problem with this arrangement is that for each bank you end up with one extraneous wire – unnecessary as it goes to exactly the same cell pole as one other wire on the previous bank. 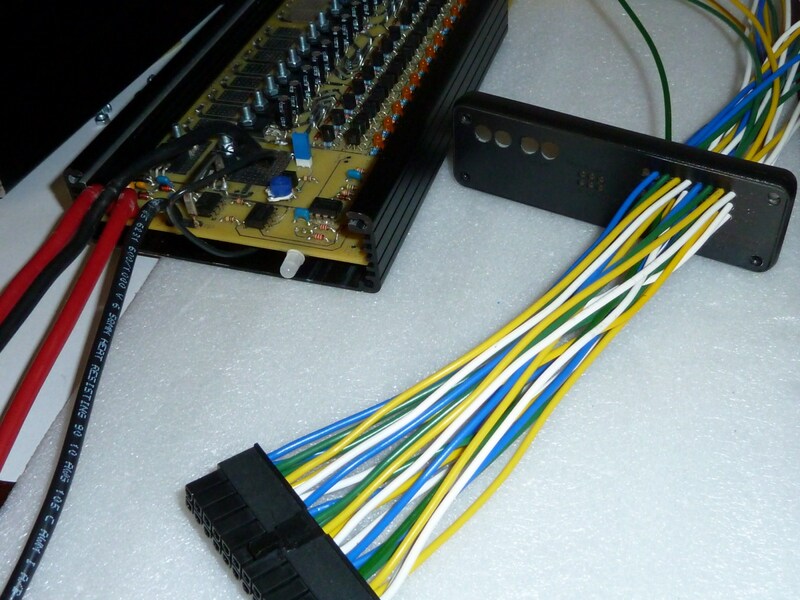 From the point of view of using an external connector, I needed to keep a ‘rational’ number of cell-tap wires: While 24-pin connectors aren’t hard to come by, 27-pin ones are practically impossible to find. To avoid having an extra wire per 8 cells to deal with, what many people do is simply put jumpers between the individual banks, connecting cell-tap connection 9 of one bank to the first cell-tap of the following bank. This is exactly what I did. I left the first cell-tap of each bank empty, adding jump-wires to connect it to the last cell-tap of the previous bank. To accomplish this, I just drilled a 2mm hole in the first and last track of each bank, connecting them with a short jump-wire on the back of the board. Below you can see the back of the board where my jump-wires connect cell-tap 9 of bank 1 to cell-tap 1 of bank 2, and cell-tap 9 of bank 2 to cell-tap 1 of bank 3. But what about the first cell-tap? Since this is the master negative pole of the entire bank, I decided it would make sense to just cross-connect it with the master negative cable which I connected earlier. 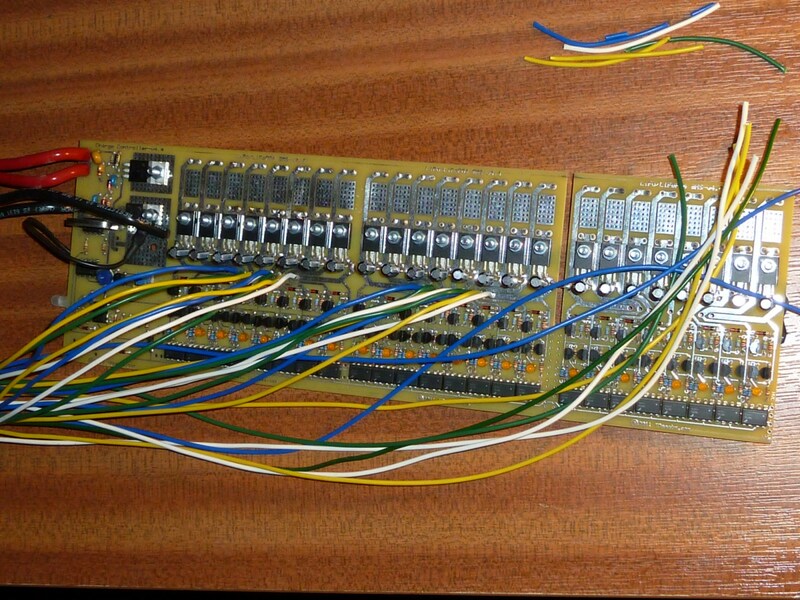 The picture below shows the board before the master negative was connected. You can see the hole I’ve drilled for the jump-wire which will join them both here. And here it is as it is today (below). You can see the black master negative cable on the far left, and the soldered jump-wire that connects these two on the back of the board. The first cell-tap hole therefore doesn’t need to be used, just like those in the other two banks. The end result is that I get to confine myself to a nice, ’round’ number of wires, and need only 24 cell-tap wires, rather than the awkward 27 that the end-plate allows for. 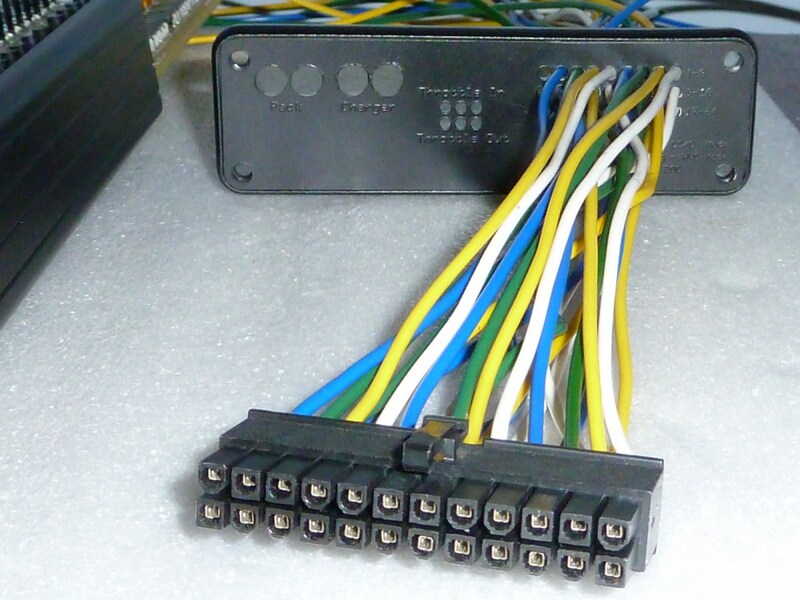 The EMC-900 came with a pair of red/black Anderson connectors to be used with whatever the charger was to be connected to, and these were duly attached to the charger input wires. For the main battery bank terminals, I used a 50 amp Anderson connector to connect to the one I have on the battery pack. 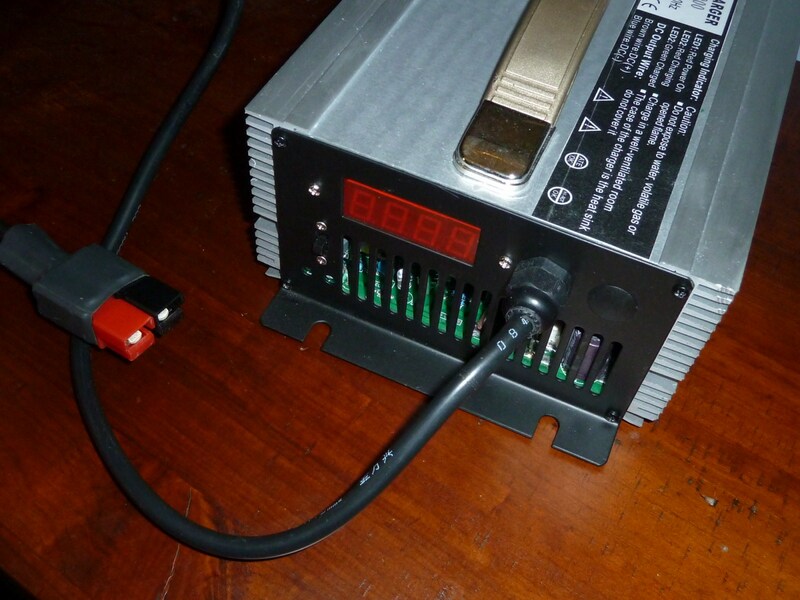 This is the BMSBattery EMC-900 charger, which I have nothing but praise for. Its voltage and current can be fine-tuned, and it has a digital display telling you exactly what it’s doing. The charging cycle can be read by the amount of current that it’s drawing, which starts out at 9.o amps, and slowly reduces during the final few minutes of a charge cycle. Once I had my LiFePO4 Lithium Pack, the next stage was to find some way to charge it, and also to manage the LVC (low-voltage cutoff) at the cell level. LiFePO4 cells are lighter and have much better lifespan and performance than SLAs, but they can only survive if their voltages are kept in a certain range. If the cells are charged beyond 3.65V or are discharged to below 2.0V, they can be permanently damaged, and have their lifespan and performance significantly impaired. Once this happens, the cells of the pack need to be replaced. It’s therefore essential to keep the pack properly balanced. A charging system needs to be in place where the individual cells are charged only up to a certain point (usally 3.6 or 3.65V), and while using the pack, the cells need to have their levels monitored so that an alarm or throttle interrupt is triggered once they fall below a certain point – usually 2.5V or 2.0V. Lithium cells quickly fall out of balance at the end of a discharge cycle, so just measuring the pack voltage is not good enough to warn the user about individual cells. A system needs to be in place that responds to this too. To do both of these jobs, you need a battery management system (BMS). It is possible to find off-the-shelf BMS systems, but usually – like much EV hardware – these items need to be imported from Chinese vendors, and documentation is notoriously poor. I’d heard stories of people coming unstuck and ending up with useless, non-functioning boxes, with no technical support to turn to for help. Users were often left high and dry with no option but to try and return the items for a refund. 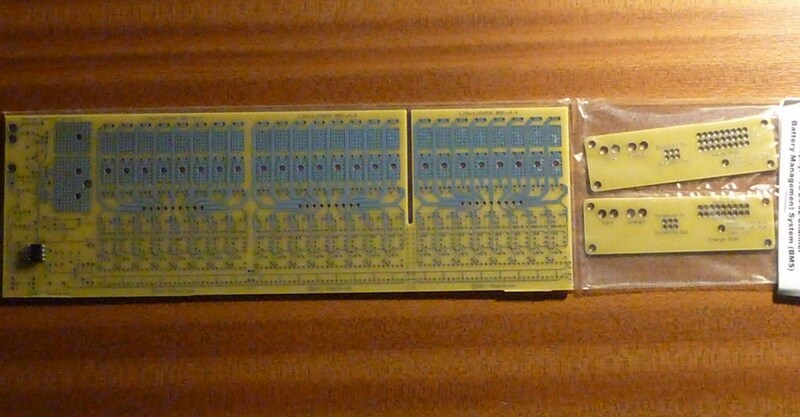 Because I wanted a tried and tested product with a strong user base and good support, I opted for the latest incarnation of the Goodrum-Fechter board. At the time of writing, this comes as a kit that you have to solder together yourself, so some soldering skills are required. However the board comes with solid assembly and testing instructions, and a spreadsheet containing a parts list that can be drag-and-dropped into the on-line shopping cart of electronics vendor Mouser. Mouser is a U.S. based company, but has outlets worldwide, so I was able to get my own order in from their European division. I wanted to build my own so that in the process I would understand more about how the board worked, but – more importantly – so I would have technical help if I ran into problems. The Endless Sphere forum has a ‘Zephyr’ thread dedicated to the ongoing development of this board, and troubleshooting of any issues that people might have getting it working. It is well-attended by the board’s designers Gary Goodrum and Richard Fechter, who have been immensely helpful and patient with all of my questions. I ended up with version 4.4 of the board. It came with one 8-pin chip already in place and wired to fix a ‘bug’ with the tracks on this version. This has been rectified on newer versions of the board. 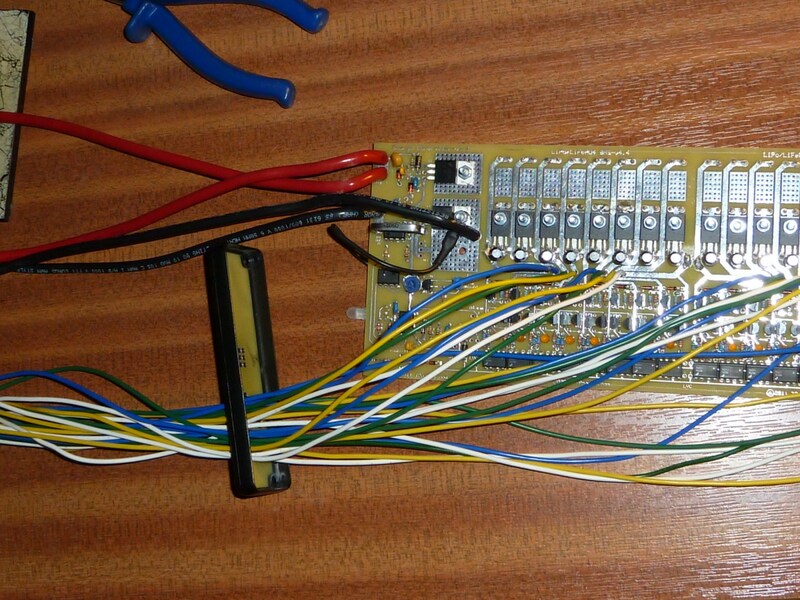 The board is clearly laid out and labelled, with component names and values stamped where the components need to go. 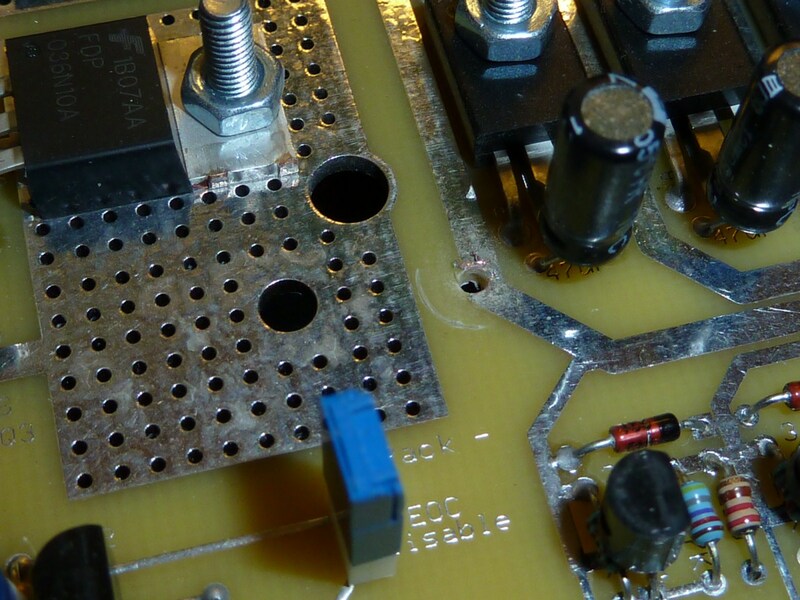 Any polarised components – like diodes or capacitors – get a square pad (the mounting for the hole on the board) where the negative end needs to go. Once my parts had arrived from Mouser, it was simply a matter of soldering a lot of components onto the board. It’s best to start with the smaller components, and then move onto the larger ones. Below the cell tap holes (those holes along the middle of the PCB which link to each cell in the Lithium pack), each cell circuit has seven resistors, a diode, an LED and three transistor-type pieces to mount. I started by mounting the resistors and small capacitors to the control circuit and the individual cell circuits, and the cell-circuit diodes. 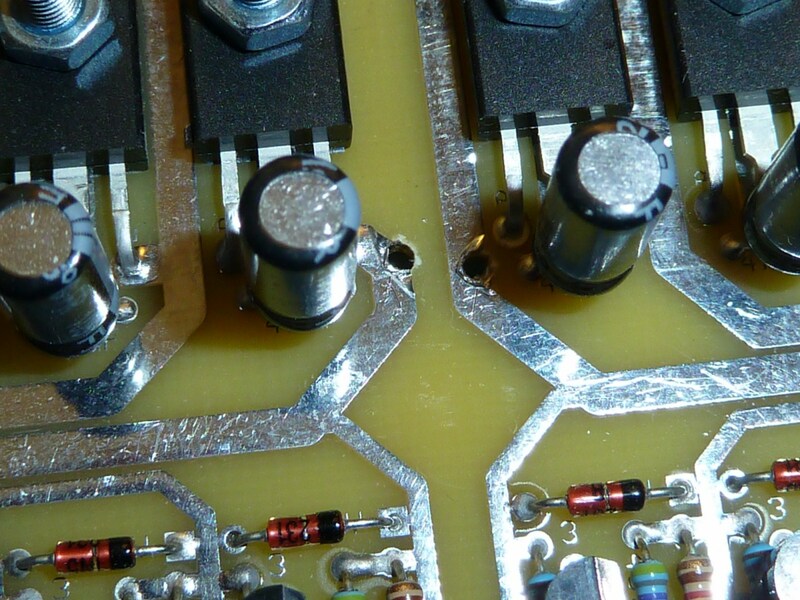 Next I added the larger, metal 47uF capacitors above the cell-tap holes. On my version of the board the negative terminal for these wasn’t indicated by a square pad on the PCB, causing some confusion. 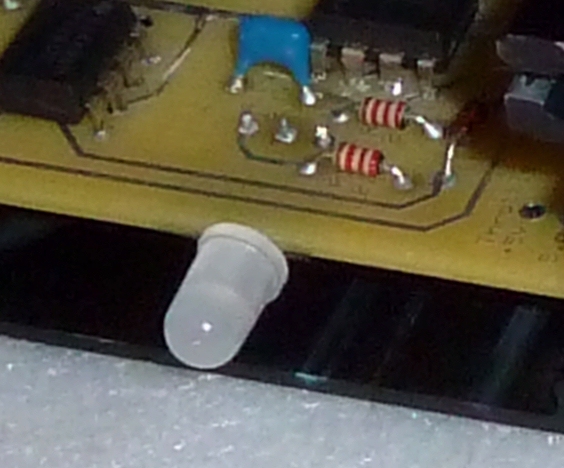 Not that these capacitors should go with the white stripe on their case (negative pole) pointing right. Note that the illustrations below show only two out of the three banks – 16 out of the 24 cell circuits on the full board. Next I mounted the orange LEDs, the two ‘TO-220’ FETs (top-left), and the 8-pin U1 and U3 chips (far left). Each chip has a white dot on it which indicates the negative pin, and this goes in the square pad. I also added the diodes to the control circuit. 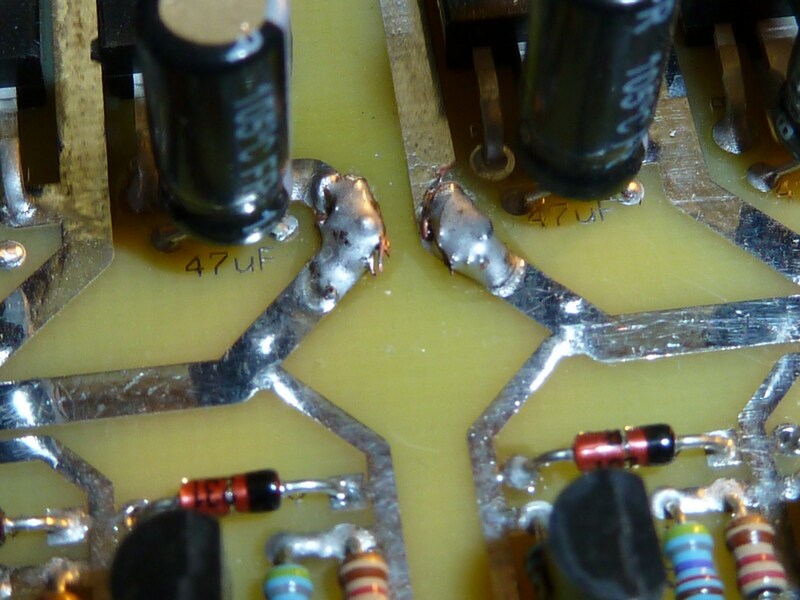 The diodes have a stripe at their negative end, which likewise needs to be mounted on the square pad. Next came the shunts, which are used to divert the ‘overflow’ voltage away from fully charged cells to the power transistors. These need to be installed with the nomenclature (the little writing on the components) face-down. 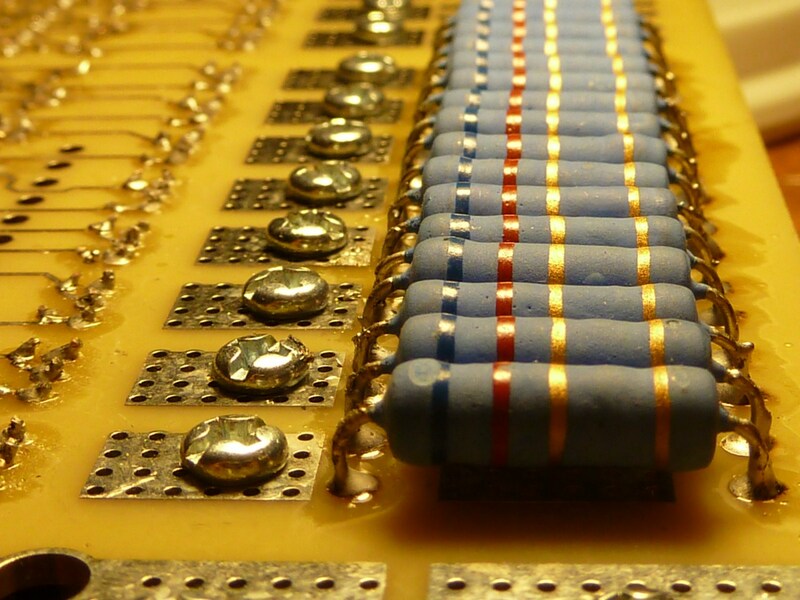 Finally, the ‘TO-92’ transistor type components needed to be added to each cell circuit. Once again care needs to be taken to put them in the right way round, but this is easy to tell by just making sure the flat faces of the components point in the right direction, as shown in the pictures. I also added the 1KΩ pot (blue-capped variable resistor), shunt resistor (that metal bar to the left) and the 24 8-pin chips at the bottom of the cell-circuits. Once again, the white dot on the chip tells you which leg goes on the square pad. The main tri-colour LED also went in here, however I found I had to mount this on the underside of the board in order for it to meet up with the hole in the end-plate. 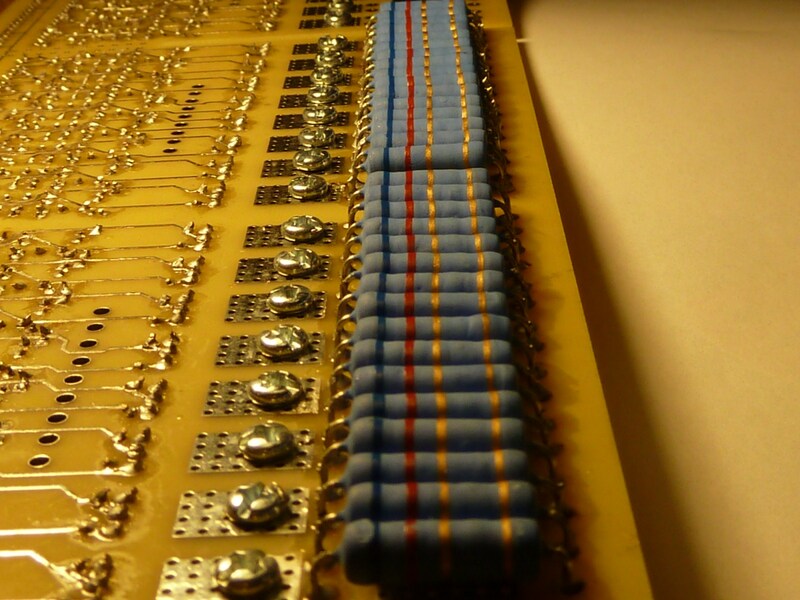 In earlier incarnations of the board, the power resistors were mounted on the top of the board, so they sat on top of those empty rectangular pads you can see. But later someone came up with the bright idea of using the case as a heat-sink by mounting the resistors on the underside of the board in such a way that they would make contact with the side of the case once the board was slid into place. Getting the spacing just right calls for some precision in mounting the components, but is aided by the suggestion of using a piece of old PCB as a spacer to hold the resistor the exact 2mm above the board it needs to for the resistors to touch the side of the case once the PCB is slid into place on the correct ‘rung’. At this point, the board should be ready to start testing. For this stage I slid the board into its case for support, and gave it a temporary power connector in the form of a couple of ring connectors bolted to the holes for the main charger input wires. 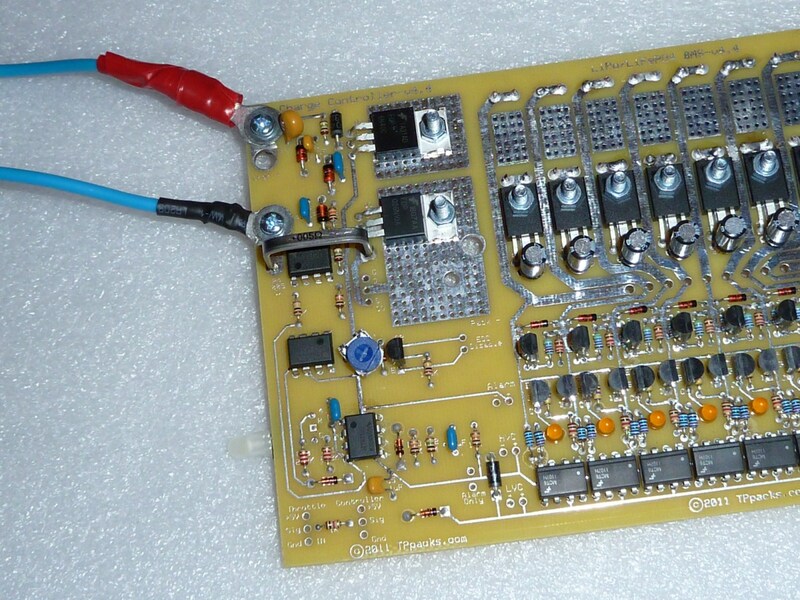 The next section (coming soon) will deal with testing and callibrating the board prior to assembling the final unit. You are currently browsing the archives for the 4.7.2. Building the Goodrum-Fechter “Zephyr” BMS category.